VIDEO: Thunder vs. Warriors Game 5 Full Highlights - 2016 NBA Western Conference Finals - Balita Boss! 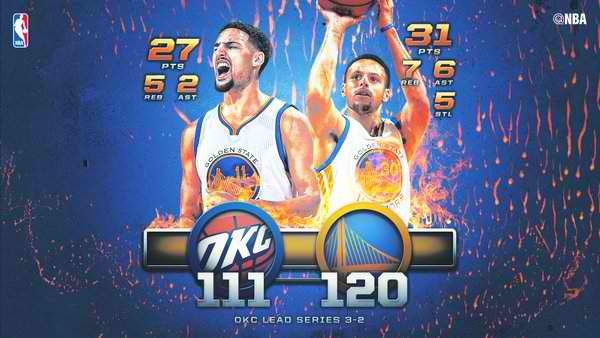 The Golden State Warriors held off the Oklahoma City Thunder in Game 5 for a 120-111 win and bring the 2016 NBA Western Conference Finals series to 3-2. Five Warriors scored in double figures, Stephen Curry had a team-high 31 points to lead the way. Klay Thompson added 27 points, Andrew Bogut had 15, Marreese Speights (off the bench) had 14 and Draymond Green finished with 11. Kevin Durant finished with 40 points, seven rebounds, and four assists and Russell Westbrook added 31 points, seven rebounds and eight assists for Oklahoma City. Warriors are going back to OKC for Game 6, after keeping their title reign and the winningest season in NBA history alive for at least one more game.